9498 Saesee Tiin's Jedi Starfighter is a Star Wars: The Clone Wars-themed set released in 2012. 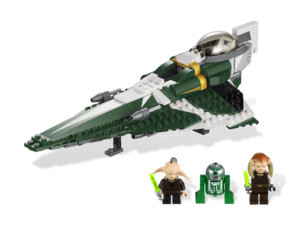 This Jedi starfighter has a dark green and white colour scheme with some flashes of gold and grey and its shape is based on that of the wedge-shaped Delta-7B Jedi Starfighter. The starfighter has three landing struts which can be deployed or folded up for flight mode. It also features four flick-fire missiles as weapons- two on top and towards the front of the ship, and two on the underside near the forward landing strut. The cockpit area which has the ability to seat one minifigure can be detached from the rest of the vehicle, and function as an escape pod. Just in front of the detachable area is space for an Astromech droid to sit in. Several stickers are used for detailing on the ship, including the Republic symbol on the right-hand side of the ship. 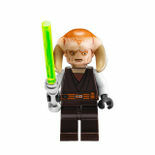 This set includes three minifigures- Saesee Tiin, along with Even Piell and R3-D5 who are both exclusive to the set. 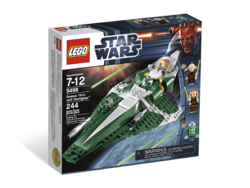 Saesee Tiin used a green and white Delta-7B Jedi Starfighter during the Clone Wars on a rescue mission to Lola Sayu. Masters Tiin, Fisto and Gallia in their Jedi Starfighters, along with one of Plo Koon's gunships, successfully assisted with the extraction of the surviving Republic prisoners and ground rescue team. This is a description taken from LEGO.com. Please do not modify it. (visit this item's product page) Hunt down the Separatists with Saesee Tiin's Starfighter! Seek out the Separatist forces! 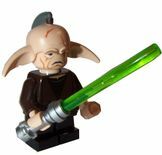 Facts about "9498 Saesee Tiin's Jedi Starfighter"
Hunt down the Separatists with Saesee Tiin's Starfighter! This page was last edited on 15 March 2016, at 06:21.